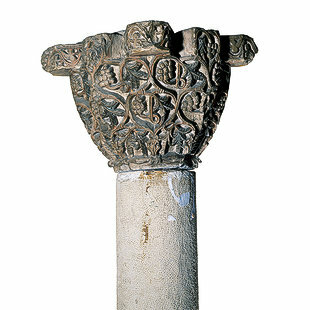 The colored limestone column capital is in the form of a whole vine with leaves and clusters of grapes. The vine in the Coptic Orthodox Church either represents the Lord Jesus Christ who said, "I am the True Vine" or the Holy Virgin, considered the true vine carrying the Lord Christ, the Cluster of Life. The vine may also represent the church.